Unlike yesterday’s and tomorrow’s plants, bald cypress is not a native to New Zealand. Taxodium distichum is instead native to the southeastern United States, Mexico and Guatemala, but is also widely cultivated. Why do the roots form knees? Despite speculation that the knees help provide oxygen to the roots in water-saturated soils, no physiological function has yet been determined (source: the “Silvics of North America” account for Taxodium distichum). Knees of mangrove trees, however, do promote the diffusion of oxygen into the roots. What’s the difference? Mangrove roots forming knees have lenticels, recently discussed in the BPotD entry on Prunus serrula. Taxodium distichum? No lenticels. For more on this beautiful tree (including photographs), see Taxodium distichum via the Gymnosperm Database on conifers.org. Reminds me so much of the Congaree Swamp National Park right down the road from me, and a place that I visit often. 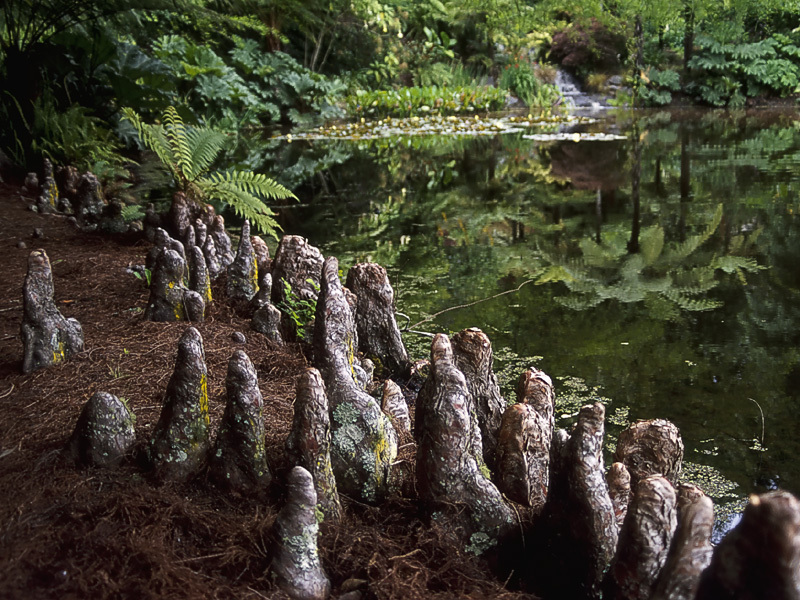 Very nice lighting and composition showing these cypress knees out in nature! Thanks for showing this one to us all! …And all the whole village gathered at the edge of the sea.. Wonderful photo for the fanciful minded, like me, thanks for this one! I love it! Wow, that’s amazing. I thought it was a Japanese rock garden when I was viewing the thumbnail. And yes, it does look like they are all looking out to sea. On a visit to the Corkscrew Alligator Sanctuary in Florida, I learned that the knees help to stabilize the trees during high winds. The ground is boggy and with the knees sticking up, everything stays in place better. At least that was my understanding.